8th grade journalism students at Southwest Community Campus tackle the topic of immigration through a collaborative journalism and art project, voted on by Rapidian readers. Reyna Garcia was born in Nezahualtcoyotl State of Mexico, Mexico. She attended art school in Bellas Artes in Mexico City before moving to New York. She started many projects for the Latin-American community in New York City, including coordinating the Mexican Cultural Project from 2000 through 2002. After moving to Grand Rapids she became very involved in the local art scene and other events that represent her Latina culture. In 2010 she participated in "Artist Unidos" with a group of Latin-American local artists in the Grand Rapids Area. She was also invited to display her art in the Mary Free Bed Hospital. 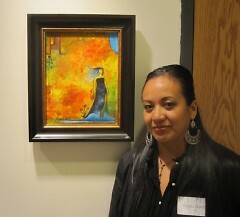 Garcia has exhibited work in many locations for several years and is currently living and working here in Grand Rapids. “Will this project help my brother come back to us after being deported?” This question was asked by an 8th grade student [whose identity has been removed to protect her family] at Southwest Community Campus (SWCC). Her class had just been introduced to their assignment for the semester. The students were told to write an article about immigration or injustice, and then create a piece of artwork to pair with the article. They would then publish the article with the artwork and share the story. Questions like hers are what inspired the idea for the assignment in the first place, but it’s much more than just a school assignment. Alejandro Escamilla’s “Words R Us” project is a collaboration of journalism and art, designed to help give his students an outlet and a voice. Escamilla teaches journalism to 7th and 8th graders at SWCC. Through various conversations and assignments in class, he discovered that many of his students were being directly affected by immigration policies and issues. Over time it became increasingly clear that many of them felt helpless and voiceless on the subject. Inspired to give them courage and hope, he formed the idea for “Words R Us,” envisioning an exhibition of student articles and artwork on the subject of immigration. He hoped it would be the perfect opportunity for his class to express themselves in a positive, productive manner. Escamilla did not only hope to provide an outlet for his students, he also wanted to provide awareness in the community about what these kids are going through. To make the project a reality, Escamilla teamed up with Grandville Avenue Arts & Humanities and The Rapidian to apply for an Arts Education Grant from the Arts Council of Greater Grand Rapids. The grant was awarded and Escamilla’s students got started. The students are hard at work on their articles and in March, Escamilla’s class will be travelling to the Cook Arts Center once a week to work directly with Reyna Garcia, a local artist whose work focuses on the subject. She’ll be discussing symbolism and identity and working with them to create mixed-media collages while sharing her own experiences on creating artwork on the subject of immigration. "Art is essential in our lives," she says. "It's the best heritage for our kids [and] it's a way to assure an excellent future for them." The faceless figures and shifting light sources in Garcia’s paintings allude to feelings of identity loss and confusion – feelings that many of Escamilla’s students are all too familiar with. After student articles and artwork are completed The Rapidian will be publishing their work under the GAAH News Bureau. The Rapidian audience is being asked to click the "Vote Up" button on the article that they are most drawn to, impressed by, or like the most. Feel free to vote for more than one. The student(s) with the most votes at the end with receive special recognition at the exhibition of their work, scheduled for May and open to the public.